By flat, I don’t mean the elevation. It was far from flat. What I do mean is that after 250 feet from our campground last night, Seth discovered our first flat tire. In the brisk morning wind we quickly disassembled the tire, aired a new one up, and headed on to Sharon Springs which was 10 miles away. We stopped at a gas station there and I ate a quick donut and filled up our water bottles. 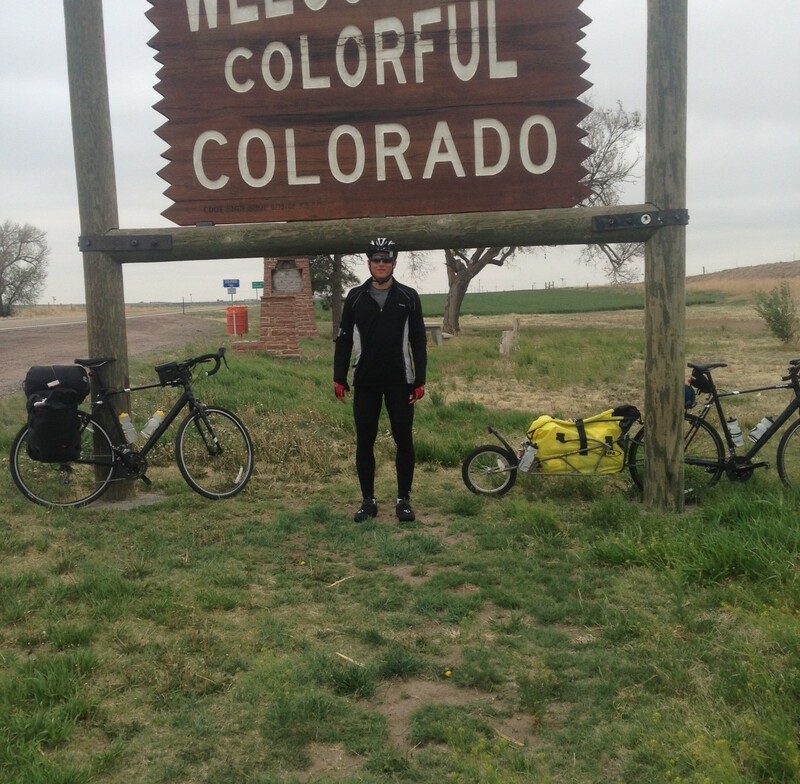 Our next destination was Kit Carson, CO which was 58 miles from Sharon Springs. 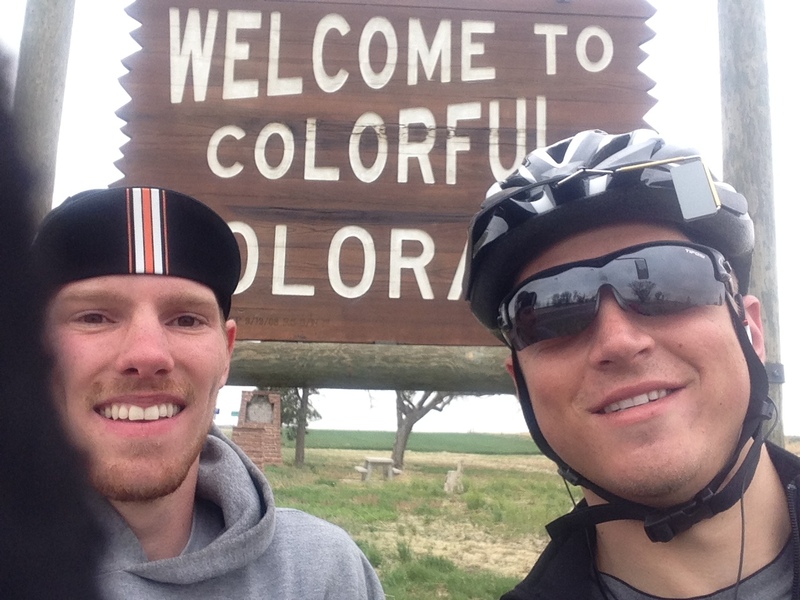 Along the way we finally reached the Colorado border – what a great feeling that was! But as the wind kept blowing, and the sun kept hiding, we quickly moved on to keep our bodies warm from the cold Colorado air. 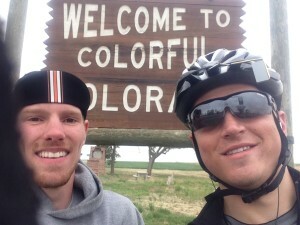 A few miles from the border we reached Arapahoe, CO where we sat down for a quick lunch. As we unpacked a loaf of bread and peanut butter, we realized… there was no more peanut butter, and we had 8 slices of break left. So, our main meal for lunch today was a whopping 4 slices of bread each… yum! We knew we had to get food as soon as possible because we had no idea when the next food place would be (gas station, restaurant, whatever). To our relief a town by the name of Cheyenne Wells had a wonderful grocery store that allowed us to stockpile back up. 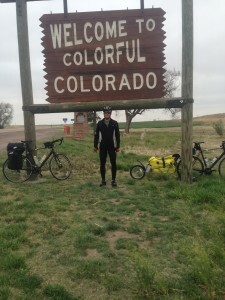 Next destination – Kit Carson (25 miles away). Up one hill, and down another, we pedaled through a harsh North wind. Luckily highway 40 faced west, so we counted our blessings by it not facing directly at us. The terrain continued to change dramatically by hills getting steeper and longer, and the landscape becoming more barren. Fatigue was starting to set in from all the hills and wind, and to make things so much better a few sprinkles of rain started coming down. 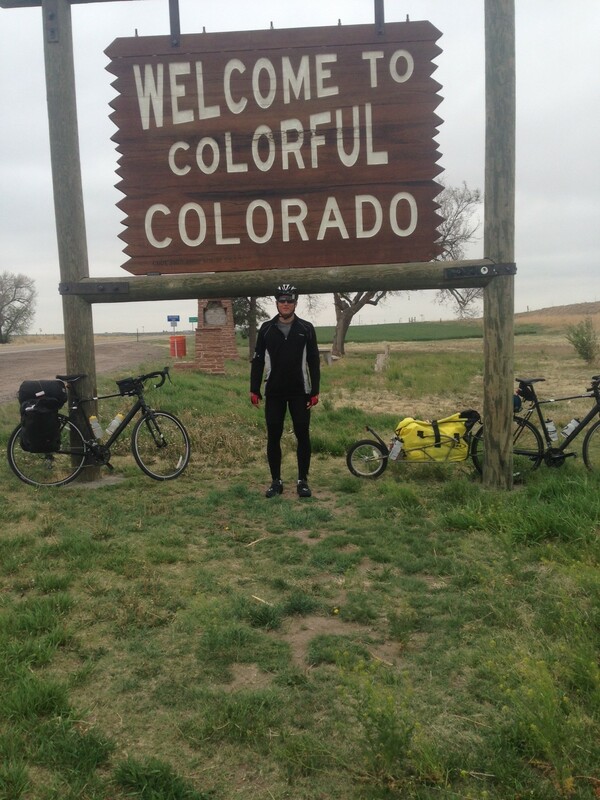 As we were 10 miles away from Kit Carson, hundreds of tumbleweeds were blowing directly across the highway at our bikes. My fortunate granted me two of them into my gears which completely stopped me. It’s not a good thing to stop your rhythm so suddenly, let alone twice! And finally, we reached Kit Carson where we had the delight of coming across a small town diner with two friendly elders working it. As we ate our meals, they talked about the snow storm coming in tonight and mentioned they have rooms available for their motel. 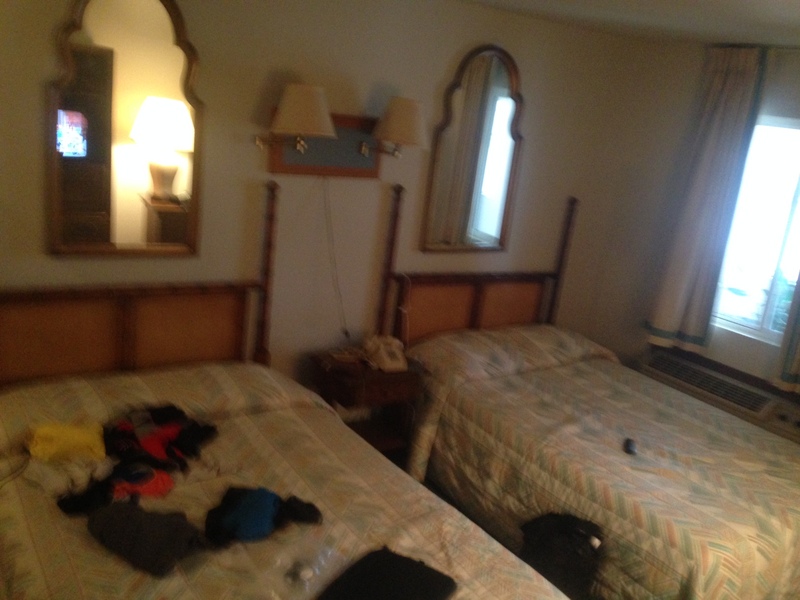 Seth and I made the collaborative decision to rent a room for the night and began unpacking our things in the room. It’s supposed to rain/snow overnight, with snow in the morning until about 10am. Whether we ride early tomorrow morning will be determined by the accumulation on the ground and how bad it’s snowing when we wake up. We’ll wait and see, but in the meantime I will surely be counting sheep in my comfy bed tonight!